The Original Mattress Company offers a full line of traditional innerspring mattresses as well as several foam and latex models and an adjustable bed. They will even construct custom sized mattresses for RV's, boats, hospitals, antique beds, trucks, or any other special needs you may have. They build their own box springs in-house with the same care they put into the mattresses. The construction of any box spring set is the base that your bed is built on. The Original Mattress Factory prides itself on using only Amish-built 1 x 4 inch wide side rails with reinforced corners for added support of the mattress. Module coil construction adds shock resistance and an end to side sway experienced in many box springs. All mattresses are sold as sets with box springs and the company recommends that you use only matching pairs as they are designed to work together to extend the life of the mattress. The innerspring unit is probably the most important component in a mattress and directly affects its comfort, support and durability. Their products tend to have fewer coils per mattress as compared to many high-end manufacturers, although still more than sufficient for a comfortable sleep. The number of coils in a mattress has very little meaning without knowing the coil type, gauge of the steel, number of turns, and whether the steel has been tempered. Heavy gauge tempered steel is standard in all Original Mattress Company innerspring coils. The type of coil and the number of turns varies between models. One very unique feature of these mattresses is that they are double sided. This is a highly desirable feature because it effectively doubles the life of the mattress. The only drawback is they require a little more care and need to be flipped and rotated regularly. All mattresses used to be made this way but it has become extremely rare since the industry introduced "no flip" mattresses which are only finished on one side. They've marketed this as an advantage to the consumer but in reality it's a cost cutting measure that shortens the life of the mattress. They offer four different quality levels of innerspring mattresses: Classic, Legacy, Regency, and Orthopedic, in order of ascending cost. Their standard Classic model offers polyurethane foam with an 8 to 9 inch thickness together with cotton and synthetic fiber pads. The innerspring unit uses 13 gauge knotted Bonnell coils with 5 turns. This is a good inexpensive mattress and box spring set with a ten year prorated warranty. They're available in plush or luxury firm. The Legacy models are 10 to 11 inches thick with the same basic construction as the Classic. However they add extra padding with a convoluted polyurethane foam topper, handles that are designed not to break, stitched cotton batting, and a higher coil count. They are a little more expensive than the Classic but may actually be a better value due to the higher quality design. They're offered in plush, firm, or pillow top. The Regency is a premium design that has all the features of the Legacy but has a higher coil count and is 11 inches thick. It offers better support and durability due to the use of the superior offset coil design in the spring unit. It has a better 10 year warranty which is non-prorated so its value won't diminish as the mattress ages. It's offered only in luxury firm. The Orthopedic models are the Original Mattress Company's flagship line and are their best sellers. They have the highest coil count and use an even better design for the innerspring unit which is exclusive to the company. The springs are 12 gauge knotted offset coils made with 6 turns for ultimate support and durability. These models also feature several more layers of foam in the top layer for extra comfort and use a better design for the construction of the box spring. They feature an improved 12 year non-prorated warranty and are available in ultra firm, extra firm, luxury firm, ultra plush, pillow top, premier super pillow top, and euro top. Foam and latex mattresses are becoming more popular today and the Original Mattress Company has a good product made out of both materials. The foam mattress is made from high density polyurethane foam which is a step up from the cheaper foam used by many manufacturers. They are less expensive than the latex models and come only in ultra plush. 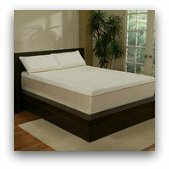 The latex foam models are padded equally on both sides and use only the highest quality Talalay latex. They use a mixture of 40% natural and 60% synthetic latex which makes the material more consistent and helps it to last longer. It has a pincore design which allows for better cooling and airflow. A firmer (32 ILD) 6-inch Talatech Talalay latex foam core begins the process, adding a softer (19 ILD) convoluted Talalay latex foam topper. This provides a very comfortable top and excellent body support. They come in plush and ultra plush. All foam mattresses are warranted for twelve years, non-prorated and are available in 9 to 12 inch thickness. 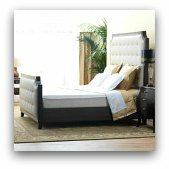 The adjustable bed offered by the Original Mattress Company and manufactured by Leggett and Platt is called the S-Cape. It's an alternative to a hospital bed with a lot more features and can be used for a patient in your home or any individual with this type of need. In addition to the flexibility of raising or lowering the head and foot of the bed, special massage features are built in. A gentle massage with variable speeds can soothe sore muscles and bring relaxation to your entire body and will automatically shut off after thirty minutes. The adjustable bed also has a wall hugger feature that keeps the mattress in one spot for convenience and, if a king size bed is desired, two twins can easily be put together on one box spring. There's also a power reserve included in the unit in case the electricity to your home is lost. The best feature of the adjustable bed is the three selections of mattresses to choose from. Orthopedic adjustable, latex foam and latex supreme can all be custom made into this adjustable unit unlike beds from many other manufacturers. An adjustable bed does not have to be uncomfortable or inconvenient and the Original Mattress Company addresses this need very nicely. In conclusion, all styles of mattresses come in seven different sizes with the base box spring to support each one. The twin, twin extra long, full, full extra long, queen, king and California king are all available for innerspring, foam and latex or even custom mattresses which may consist of extra layers of padding or pillow tops. We think you'll agree that the Original Mattress Company has all the bases covered when it comes to their product selection. For further reading on comments made by OMF customers visit: Original Mattress Factory Reviews.